Buyer purchasing power is one of the biggest influences on home prices. Home price increases cannot exceed what homebuyers are able to pay. Therefore, when buyer purchasing power falls, home prices are likely to follow. When purchasing power rises, the seller’s outlook for a rise in pricing is good. The buyer purchasing power index (BPPI) has been negative for over a year in the first quarter (Q1) of 2019, as fixed rate mortgage (FRM) rates rose through much of 2018. While purchasing power has consistently fallen since 2016, home prices rose unabated for years — until they began to decrease in Q3 and Q4 2018. California home prices have long been untethered from the fundamental influence of mortgage rates on prices, but have now begun to retreat back to reality. Interest rates are expected to remain near their present level for most of 2019, following the short-term rate increases engineered by the Federal Reserve (the Fed) throughout 2017-2018. Now that the Fed has set the next recession in motion with their rate hikes, they sense it is time to hold off on increasing rates further while the economy cools. In turn, buyer purchasing power will return closer to zero in 2019. But the damage has already been done in terms of future home prices. Buyers are more hesitant to purchase in a falling price environment, and most will wait until they are sure that prices have bottomed, which is expected to occur in 2020-2021. Updated February 10, 2019. Original copy published August 2013. 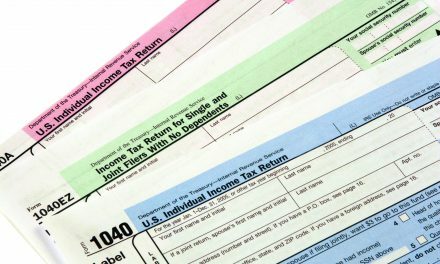 The BPPI is calculated by first tuesday using the 30-year FRM rate and the average income in the state of California. The BPPI is significant because it displays the change in purchasing power from year to year. Thus, a homebuyer is able to qualify for more principal than one year earlier when the index moves upward. mortgage interest rate, which varies constantly. The BPPI varies from month to month as the average 30-year FRM interest rate fluctuates. The 12-month moving average in the chart shows a more significant trend than the monthly change. As soon as the BPPI trends upward or downward, watch for similar movement in home pricing several months forward. When the BPPI trends down, home sales volume falls and prices dip approximately 9-12 months later. When the BPPI trends up, home prices will rise more quickly — roughly six months later. The time difference is due to home sellers holding onto their sticky price delusions in a slowing market. 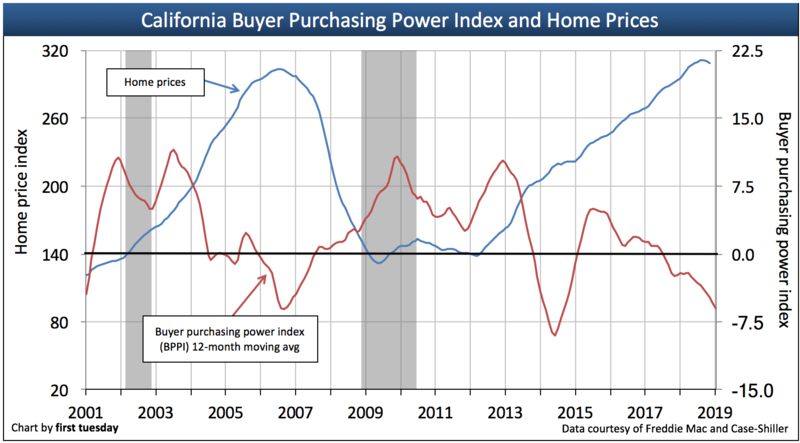 Viewing the chart above, you may need to take a step back to see the long trend and correlation between buyer purchasing power and home prices. As homebuyers are able to borrow more, their purchasing power increases as do home prices. When the opposite occurs (when interest rates rise) their purchasing power is reduced, a drag on home prices. Of course, BPPI is not the only factor influencing home prices. Further, forecasts are never perfect since conditions affecting real estate transactions are constantly changing and their effects are not fully known until they occur. Other significant factors follow. The personal savings rate may be the greatest long-term influence on home prices. This is because the amount of savings a homebuyer has affects the amount of the down payment they can make. With a 20% down payment, a homebuyer qualifies for a higher purchase price, as significantly more of their monthly payment (up to 31% of their income) goes towards paying off principal instead of mortgage insurance. qualify for smaller loans, which directly drags down prices. New construction affects the housing inventory in response to a demand for more housing. In doing so it pushes and pulls on home prices. In turn, new construction works to keep prices from rising too fast into a bubble. However, sufficient new construction to meet the demands of a growing population has a long-standing enemy: zoning regulations. the lost opportunity (investment income) incurred by using savings to buy a home (cash or cash to new loan) instead of renting. Consider also that today’s younger generation is less mathematically challenged about housing than their parents’ Baby Boomer generation. If there are insufficient construction starts near city centers and high-paying jobs, this drives home prices and rents up to the extent additional housing is needed and not provided. When housing is not able to be built in the proper locations, over-demand for a static housing supply causes prices to explode. This may sound nice for the few who sell (around 6% of owners annually), but it is unsustainable and dangerous for local economies as it stifles business growth. Just as population growth influences construction starts (so long as zoning doesn’t interfere), demographic movement also affects household formations, which in turn influence home sales volume. If population growth is slow and zoning renders construction starts moot, then housing goes up in price only at the rate of personal income inflation, limited by movement in mortgage interest rates (and that bring us back to buyer purchasing power). If growth remains at 1% annually in California, we need additional housing by construction to accommodate that annual 1%. Further, if starts do not take place when the time is right, the price of existing housing rents and purchase prices go up. However, the homeownership rate will linger at and below 55% for years to come (at 55% as of Q3 2018, down from the 60.7% peak in 2006). The long-term support needed from homebuyer occupants is lacking, evidenced by the downward trend in the homeownership rate. The price spike seen in 2013-2014 came from a short-term, temporary source: speculators. 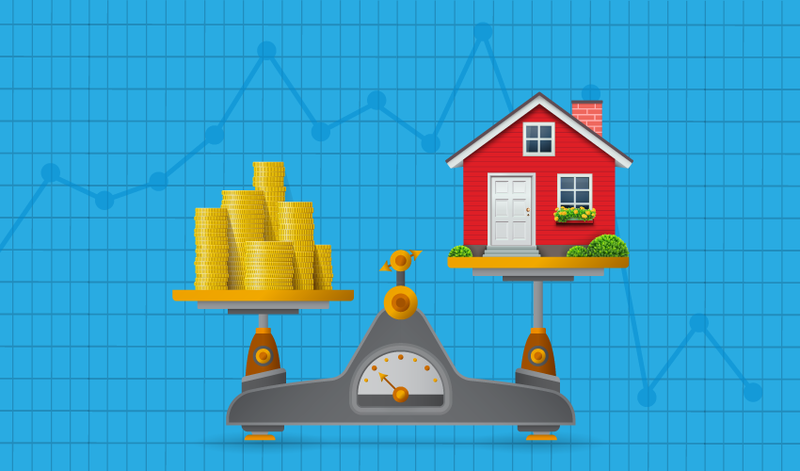 Adjustable rate mortgages (ARMs) have a symbiotic relationship with home prices. ARM use increases when the 30-year FRM interest rates rise too high and reduce homebuyer ability to qualify for the same amount of mortgage as they did in prior months. The shift from FRMs to ARMs to fund closings artificially keeps home prices from dropping for a time after a mortgage rate spike. Of course, while the low teaser rate allows homebuyers to buy a higher-priced home, the interest rate will adjust upward. 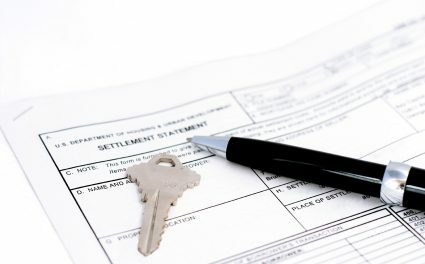 Monthly payments will reset higher, exposing ARM-financed buyers to reality, and these buyers may find themselves unable to make the higher payments. They are gambling that their incomes will rise faster than rates — this bet will not pay off for the homebuyer as we head directly into two decades of mortgage rate increases. This financing pattern in large part contributed to the housing bust of 2006-2007 and the following 2008 recession and financial crisis. The due-on-sale clause will see a resurgence in the coming years. In future, interest rates will rise and homebuyers will attempt to assume sellers’ mortgages at the old, low rates. Lenders will of course try to interfere so they can charge their new, higher rates to increase their portfolio yield by adjusting old fixed rate loans. The greater the level of lender success in interfering with sales, the greater will be the drag on home prices. If homebuyers are able to assume mortgages at the old, low rates, prices will be free to rise with the rate of inflation and demographic-driven appreciation. If on the other hand homebuyers are forced to take out new mortgages at higher rates or assume old loans at current rates, prices (and thus sellers) will face downward pricing pressure. This due-on aspect of mortgage law has the exact same effect as buyer purchasing power. Capitalization (cap) rates always follow interest rate movements. That is, cap rates are set and applied on the perception of a future flow of income. The lower mortgage interest rates are, the lower a cap rate likely will be if the buyer is to achieve their desired future flow of income. However, as rates rise, cap rates will also have to rise. And if not, few will invest in real estate. In turn, as the cap rate increase evolves, the prices on income properties will fall. Today’s acceptable cap rates will become tomorrow’s unacceptable cap rates. In the process, property values are destroyed for inability to raise rents beyond the rate of consumer inflation (one-third of a tenant’s income, more or less). It’s widely known that the speculator activity of 2012-2013 pushed home prices wildly out of control. Their bidding frenzies, multiple acquisitions and demand for each newly listed property snatched a majority of homes sold out of the reach of end users. This conduct further compounded the problem of pricing. Of course, speculators are unreliable and now that they have largely exited the market, home prices have begun to flatten. But what about more stable, longer-term investors? Buy-to-let investors are a stable influence on prices. They do not get caught up in the same sort of buying fever common to grab-and-flip speculators and emotional buyer-occupants that we find today. Long-term investors will not pay too much for a home. For pricing, they rely on the simple math of a capitalization equation (the reciprocal being the net income multiplier or GRM) to ensure they receive a market rate of return on investment (ROI) based on net rental operating income (NOI). All of these factors get derailed and thinking is changed by economic shocks, like the 2008 recession, the financial crisis of zero-bound interest rates and the present recovery. California’s broader economy works on home prices by weaving in and out of all the factors affecting home prices. Commodities (like gas, for instance) will swing violently from month to month. If gas prices trend in an upward direction for a year or more, that’s when the price of property begins to feel the effects as homebuyers’ wallets feel the strain. Further beyond California’s borders, Wall Street can be a massive influence on home prices. It has always been said that when Wall Street gets into real estate, they screw it up. A prime example is the Millennium Boom and subsequent bust, which all comes back to Wall Street financing as permitted by mortgage deregulation. All of these factors taken together initially make for a confusing picture of the housing market. So how can you simplify the picture to figure out the best time to buy when prices are low and sell when prices are highest? Look to buyer purchasing power to determine what direction prices will move in 6-12 months. If there are abnormalities in the market (like a high speculator presence), then consider what that action will do to volume and prices as well. Agents who are aware of all aspects of the future housing market are more likely to succeed in their pricing goals than those who rely on two-month-old and meaningless median price figures fed to and reported by the media. A lot of useful information and thoughtful commentary. However, residential real estate is local, and therefore state-wide numbers have little value compared to what is true in a given market. For example, anywhere within commuting distance of Silicon Valley has little difficulty with BPPI and values rise accordingly. While communities in the far north of the state, the central valley, and the Inland Empire in SoCal will probably take several more years to reach home prices like those seen in 2006. As the old saying goes, your money doesn’t have to live where you do! Excellent Article. On line, it’s not available 4 the public.